Russia rejected U.S. charges that Moscow may be supplying the Taliban in Afghanistan, accusing Washington of peddling "a lie" to divert attention away from its own failed policies in the country. The dismissal from the Russian Foreign Ministry, reported by Reuters, arrived a day after the top U.S. general in Europe testified on Thursday that the Kremlin's influence on Afghan Taliban insurgents is growing, potentially in direct military aid. "I’ve seen the influence of Russia of late—increased influence in terms of association and perhaps even supply to the Taliban," Army Gen. Curtis Scaparrotti testified before the Senate Armed Services Committee. Gen. John Nicholson, the commander of U.S. forces in Afghanistan, expressed similar concerns last month. Nicholson told the Senate committee in February that he believed Russia was attempting to "legitimize" the Taliban through a "false narrative" that the militants were fighting against the Islamic State in Afghanistan, rather than government forces. He too said he had seen evidence of an "increasing level" of Russian support for the Taliban. The Taliban announced Thursday it had captured the strategic south Afghan district of Sangin after a years-long offensive to extend their reach in the region. 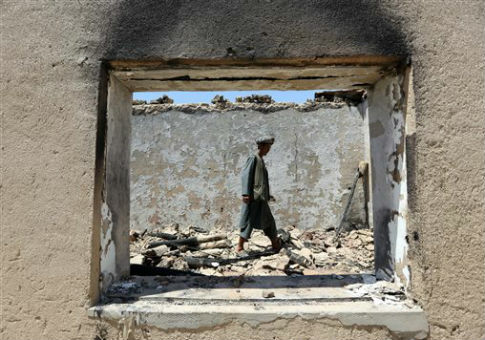 The Afghan government pledged a counterattack to retake the town, but a formal plan has yet to be confirmed. This entry was posted in National Security and tagged Afghanistan, Russia, Taliban. Bookmark the permalink.